Brandon Scott Rumsey (b. 1987, Las Vegas, NV) is an award-winning composer, multi-instrumentalist, educator, and interdisciplinary collaborator whose music has been featured at venues across the nation. Brandon’s music has been featured by the New York Festival of Song, Hong Kong Academy of Performing Arts Global Composition Seminar, University of Texas New Music Ensemble, Brevard Music Center, Bowdoin International Music Festival, Belvedere Chamber Music Festival, New Music on the Point, Oregon Bach Festival Composer’s Symposium by Fireworks Ensemble, the Eugene Contemporary Chamber Ensemble (ECCE), and four North American Saxophone Alliance (NASA) conferences. Brandon has received honors from the American Composers Orchestra, National Federation of Music Clubs, ASCAP, Luna Nova Music, and the University of Oregon. Brandon actively collaborates with creators from various artistic disciplines. As a composer, conductor, and musical director he has worked on numerous productions including musicals, contemporary plays, and inter-media performances in unique spaces. He has served as the Assistant Director of ECCE, Director of the “itch” New Music Ensemble at Brevard Music Center, PR Coordinator of CLUTCH New Music, and Composition co-chair for The Graduate Association of Music & Musicians at UT (GAMMA-UT). Brandon is pursuing a doctoral degree in composition at the University of Michigan, studying composition with Bright Sheng and bassoon with Jeffrey Lyman. He holds a master’s degree in composition from The University of Texas at Austin and a bachelor’s degree in composition from University of Oregon. LIMELIGHT was composed at Brevard Music Center in the summer of 2013, and is an expression of my earliest musical influences: music for theater and film. These two movements are intended to serve as incidental music for scenes, each left to the listener’s imagination, experienced within a concert setting rather than a theater. Internationally recognized throughout the U.S., Europe, and Asia as a distinguished composer. Composer of 120 works spanning all genres. Pieces awarded Gold Medal- First Prizes in international composition competitions, Guggenheim Fellowship, awards from both National Endowments (in Music // in Humanities), 2003 Aaron Copland Award, 2012 honors in Orchestral Composition (The American Prize), and top prizes chamber music (Third Millennium ; Tempus Continuum). Recently designated 2014 Commissioned Composer by The Sorel Organization: 50-minute fourth symphony, Pure, Cool (Water), which received its world premiere by the Janacek Philharmonic in Vienna in November 2014, and is now recorded by that orchestra. Actively commissioned. Music used as competition repertoire for international contests in piano, conducting and voice. Two dozen CDs currently available (Naxos, MSR Classics, Navona, Leonarda, Albany). Two works on Century Lists (Chamber Music America, International Piano magazine ). Publisher: Subito Music Corp. Also a skilled writer and editor (creator and editor-in-chief, THE MUSICAL WOMAN - An International Perspective [Greenwood Press]) and active juror for national and international competitions. She is also the author of essays for NewMusicBox, Keynote Speaker for the College Music Society, and wrote the 2009 Article of the Year for MTNA, "Celebrating New Music". Zaimont is a distinguished teacher, having led the Composition program at University of Minnesota for close to fifteen years, formerly department chair at Adelphi University, and earlier a faculty member in Theory and Composition at units of the City University of New York and Peabody Conservatory. In the SONATA-RHAPSODY I’ve looked to reveal some of the violin’s many personalities, capitalizing on its intrinsic agility and the wide variety of nuance it commands to shape an attack or characterize a release, as well as its capacity to sheerly “sing.” The three long movements present violin and piano as equal partners. Each is in a rounded form where the principal materials begin developing almost immediately. In character, each of these movements lives up to its title: Nuance, expressivity, a certain sweetness, and dramatic contrast characterize the romantic Nocturne. Its slow, quiet rising-second motive serves as building block for the entire work. Aria’s sorrow comes forward in a long, deep-throated melody which continually folds back on itself; this is countered twice through breathless agitatos. Dance (Twisted) is just that. It begins in unbalanced stutter with violin pizz. and piano rhythms beaten on the lip of the lid. Once the off-balanced beating is fully launched it never stops, sometimes receding to background but most often remaining right on the music’s surface. Its mid-section quiets down (though still beating in tempo) and layers over a pale recollection of the Nocturne’s melody; when this disappears, the aggressive edge of the dance is recovered, and intensifies to the close. The two brief intermezzi (Thinking 1, Thinking 2) bring the violin forward in outbursts, irregular shards of tune, and tiny ‘arguments’ between the two players that end in no agreement. Wei-Chieh Lin was born in Taichung, Taiwan, and his music has been performed by ensembles such as Ensemble Intercontemporain, Orchestre Philharmonique de Radio France, National Taiwan Symphony Orchestra, Taipei Sinfonietta & Philharmonic Orchestra, Le Nouvel Ensemble Moderne, Insomnio, Alarm Will Sound, Ensemble Phoenix Basel, ECCE, Meitar, Vertixe Sonora, Villiers Quartet, Xasax, Makrokosmos, members of Klangforum Wien, The New Juilliard Ensemble, Formosa Quartet, Cadillac Moon, and members of eighth blackbird. Mr. Lin’s compositions have received awards including the Honorable Mention of the Gaudeamus Muziek Prize of 2011, First Prizes of the Sir Ernest MacMillan Award and the Pierre Mercure Award from SOCAN, two ASCAP Morton Gould Young Composer Awards, and the First Prizes of the 2009 and 2010 National Symphony Orchestra of Taiwan Composition Competitions. Mr. Lin has participated in festivals including Aspen, The Wellesley Composers Conference, Académie musicale de Villecroze, Domain Forget, active participant in Manifeste@Ircam, Voix Nouvelles Royaumont, Etchings, Mizzou, Sonutopias Campusculturae, Darmstadt, Impuls, Ensemble Linea Academy, and the Gaudeamus Muziekweek, as well as residencies at Paul Sacher Stiftung, Yellow Barn, the MacDowell Colony, and the Banff Center. Mr. Lin completed his MM and DMA in composition with scholarship at The Juilliard School under the guidance of Milton Babbitt. The initial idea for this work is to uncover the wealth of sonic possibilities on the cello, from exploring the shimmering, fluttering, and flickering of harmonics, the various complex and unpredictable timbre effects, to the varying degrees of saturation/noise. The process is to deconstruct all these materials and reconstruct them into multiple layers of texture that gradually transforms and disintegrates over time, what emerges is a rapid and constant shifting of perspective that extends through several trajectory of elaborations. Moments of rapture disrupt such discourse, with an ever increasing density that creates a friction between states of stability and instability of sound. The piano for the most part supports the cello by generating artificial resonances that intensify the subtle timbre difference between the two instruments, adding yet another layer of quivering sonic landscape that trembles through the refraction of sound. The music of Eleanor Aversa has been described as “shimmering” (The New York Times), “ethereal” (The Society for New Music), and “lustrous” (San Francisco Classical Voice). She has received awards and grants from ASCAP, the Queens Council on the Arts, and the American Composers Forum. Other honors include the Northridge Composition Prize, the Brian Israel Prize, and fellowships from the MacDowell Colony, the I-Park Foundation, and the Virginia Center for the Creative Arts. Often spiritual, humorous, or thought-provoking, Dr. Aversa’s work has been performed in 20 cities. Venues include the Boston Conservatory, the Philadelphia Art Alliance, the Disjecta Contemporary Art Center of Oregon, the Bowdoin International Music Festival, the June in Buffalo Festival, Tanglewood, and the Música Viva Festival of Portugal. Performers include the International Orange Chorale of San Francisco, clarinetist Jean Kopperud, the Juventas New Music Ensemble, neoLIT, the Rawlins Trio, San Francisco Choral Artists, and Second Instrumental Unit. Dr. Aversa holds a BA in Russian Language and Literature from Princeton University as well as degrees in Composition from the City University of New York Queens College and the University of Pennsylvania, where she studied on a Benjamin Franklin Fellowship. She currently serves on the piano faculty of the Settlement Music School. Program Note: Something Gleamed Like Electrum takes its title from Ezekiel’s vision of the four cherubim: “As I looked, a stormwind came from the North, a huge cloud with flashing fire enveloped in brightness, from the midst of which something gleamed like electrum. Within it were figures resembling four living creatures that looked like this: their form was human, but each had four faces and four wings, and their legs went straight down; the soles of their feet were round. They sparkled with a gleam like burnished bronze” (Ezekiel 1:4-7). Electrum is an alloy of gold and silver. New York-based composer Nina C. Young (b.1984) writes music characterized by an acute sensitivity to tone color, manifested in aural images of vibrant, arresting immediacy. Her experience in the electronic music studio informs her acoustic work, which takes as its given not melody and harmony, but sound itself. Young's music has garnered international acclaim through performances by the American Composers Orchestra, Aspen Philharmonic Orchestra, Milwaukee Symphony, Orkest de ereprijs, Nouvel Ensemble Moderne, the American Brass Quintet, Argento, Either/Or, JACK Quartet, Sixtrum, wild Up, and Yarn/Wire. Winner of the 2015-16 Rome Prize in Musical Composition, Young has also received a Charles Ives Scholarship from the American Academy of Arts and Letters, the Martirano Memorial Award, the Druckman Prize, and honors from BMI, IAWM, and ASCAP/SEAMUS. She has held residencies at the Aspen and Atlantic Festivals, NEM’s 2014 FORUM, and the Tanglewood Music Center. 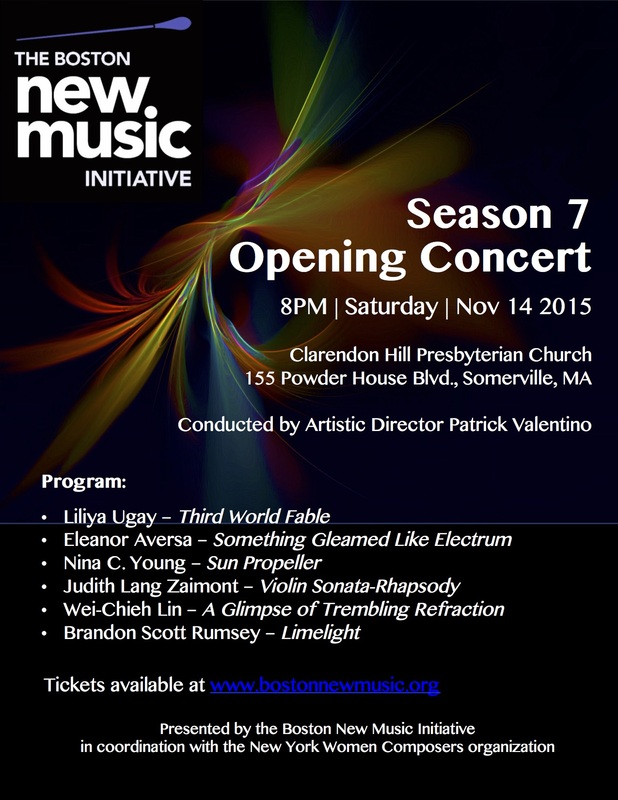 Recent commissions include works for the Metropolis Ensemble, the ACO, wild Up, and pianist Marilyn Nonken. Young is collaborating with vocal bassist Andrew Munn and the Nouveau Classical Project on an evening-length, multimedia cantata Making Tellus: Sketches of a Cosmogram for the Anthropocene – a work for voices, mixed chamber ensemble, and interactive media that addresses the current socio-political conversation surrounding the Earth’s rapidly changing geology. A graduate of McGill and MIT, Nina is completing her DMA at Columbia University. She worked as a research assistant at the MIT Media Lab and the Centre for Interdisciplinary Research in Music Media and Technology. She is an active participant at the Columbia Computer Music Center where she teaches electronic music. Young serves as founder and Co-Artistic Director of new music sinfonietta Ensemble Échappé. The title, Sun Propeller, refers to the propeller-like rays of light that occur when sunbeams pierce through openings in the clouds. Scientifically, these columns of light that radiate from a single point in the sky are known as crepuscular rays. The actual phrase “sun propeller” is a literal translation of the Tuvan word for these sunbeams: Huun-Huur-Tu (also the name of a famous Tuvan folk singing group). The idea for this work came while I was researching the Tuvan music of southern Siberia. Their music, particularly the practice of throat singing, is a vocal imitation of natural surroundings (the sounds of babbling brooks, wind resonating against mountains, etc.) and is used to pay respects to the spirits of nature. This type of Tuvan music is built up upon a low drone-tone with overtones floating above. The music values timbre and vertical intervals over traditional melodic and harmonic principles. Sun Propeller does not attempt to imitate Tuvan music, but rather, it borrows the concept of the static drone and timbre preference.